Recently Google made waves with the launch of the ability to download your entire search history. It horrifies some people and intrigues others (like me). What secrets do you an Google share that no one else knows? It got me thinking. And it got me searching. And as I delved into my own personal Google history it told a story. I’ve written a lot over the last few months about our crash collision with cancer as my husband was diagnosed with stage 3 melanoma in early July. As I scanned through my searches it gave me a window into the whirlwind of surviving a cancer diagnosis. It’s not the typical story, but it’s an interesting spin. You can literally “see” the thought processes as we moved from initial shock, to treatment options, through chemotherapy, and ultimately the psychological trauma we went through. So here I am, opening my personal journey as told by Google. Day of Diagnosis (the doctor called at 5:15 pm). You can read about it here. The doctor was unable to reach my husband as he was at work and so they called me. I waited for him to get home knowing I was going to be the one to have to give him his diagnosis. I called everyone I knew in the medical profession and spent the night downing a bottle of wine and researching. By the time he got home I was an absolute wreck. I was full of Pinot Noir and abysmal statistics. We sat out on the porch and I tried my best to tell him without scaring him. I failed miserably. 6:35pm is invasive melanoma thatbserious? All of the medical professionals that I had contacted (mostly family members) had recommended we get a surgical oncologist. I drove down to our family doctor and demanded a copy of the biopsy results and sent them out as a text message to everyone I knew that might have some insight. I work in the medical field and I know probably more than I should. I pooled all my resources making call after call. The biopsy results gave us our initial staging which was T3a. We had met with our oncologist and had his first surgery scheduled. The baby had his appointment and we confirmed it was not melanoma. I exhaled for the first time in a week. My child was safe. I could now focus on my husband and his upcoming surgery. The weeks were excruciatingly long as we were helpless to do anything. Knowing there was cancer in his body and that it was growing everyday but not being able to do anything about it was a challenge. We were trying to sit still all the while wanting to stand up and scream, to run, to do something, anything. We went on a family vacation to the beach. The hubs was 8 days out from surgery, had clear PET scan, and we were feeling pretty good. We were so grateful that we had caught it early and this was behind us. I was confident it was over and we could begin to live again. Then our surgeon called and told us it had spread to the lymph nodes and he was now classified as Stage 3 Melanoma. Blindsided does not even begin to describe this news. This meant he would have to have a second surgery to remove all of his lymph nodes in the affected area. It also meant he would have to undergo some sort of chemotherapy. “Chemotherapy” the word made me shudder. I couldn’t wrap my head around it- this wasn’t real, this wasn’t happening to us. My husband went upstairs to take a shower and wash the salt and the sand off of him. I’ll never forget when he came back downstairs his eyes were red and puffy. But we didn’t talk about it. We couldn’t say it out loud yet. We made the decision that we should find a top notch cancer center and get a second opinion. While the children swam in the ocean and played on the beach I spent the day inside the beach house calling center after center to see about getting an appointment. We met with our oncologist and were told that a clinical trial was our best option. There are exactly 3 options in stage 3 melanoma: 1. wait and watch for recurrence, 2. 1 year of chemotherapy on interferon which doesn’t have great results and is one of the toughest drugs on the market, or 3. a clinical trial. We were told a clinical trial at a center near us had an opening and we were referred to that hospital for a consult to see if we would qualify. The big concern with melanoma is that it will spread to the brain. If this happens there is about a 6 week survival rate. I began to panic. 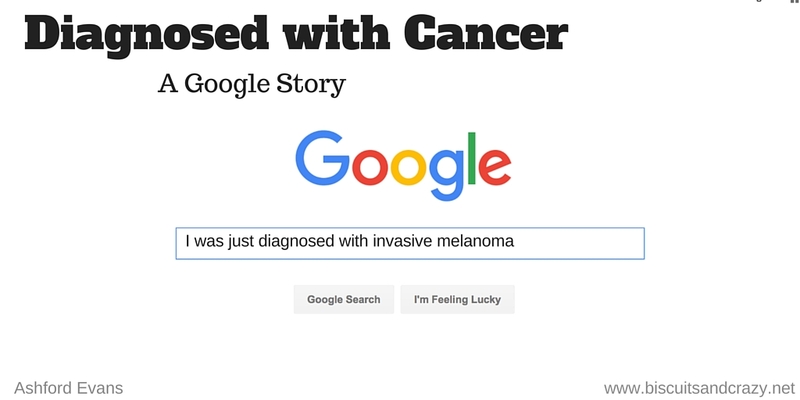 5:31pm what is metastatic melanoma? We traveled to Duke Cancer Center for a consult with a melanoma specialist. He agreed that our best bet was to get into the clinical trial going on with a drug called Yervoy (or ipilumimab). We would have to wait on the second surgery biopsy to see if we qualified for the trial. He had three cancerous lymph nodes. To be allowed into the trial he needed one more cancerous node to move him from a stage 3a to a stage 3b. We found ourselves in an alternate state of being where we were actually hoping that they would find more cancer- just one more node would allow him a much better treatment option. We realized the irony. Who in their right mind wishes for more cancer? We did. We got the results of our second surgery and learned that he was still one lymph node short of qualifying for the clinical trial. It was bittersweet. We were happy that there was no evidence of cancer remaining in his body but we knew what it meant as far as treatment went. Our only option was the full year of interferon (or intron). I began desperately trying to find a way to get the Yervoy approved through insurance despite the fact that it was considered “off label” and therefore not a covered treatment option. I also began researching any other clinical trials that he might be able to participate in. We learned that our insurance had denied coverage for Yervoy and our only choice was a year of interferon (or Intron). I remember sending my best friend a text that said “I am going to send this and then turn my phone off for the rest of the day. Insurance denied. We will be doing a year of interferon. I am devastated.” And I turned my phone off. For a few days. I visited my doctor for a routine physical and had a complete breakdown. She was the one who had given us the initial diagnosis. She had been copied on all of his medical records. She knew exactly what was going on. Finally, she prescribed Xanax for the panic attacks I was having. 7:50pm can you drink on xanax? We started treatment with interferon on October 6. I was in the throes of survival through chemo while he received daily infusions of chemotherapy. On October 24 we received a letter from our insurance company stating he had been approved to receive treatment with Yervoy (a much kinder drug) but we had already begun the interferon and therefore switching was not an option according to our physicians. Again I felt like I had been suckerpunched. That’s the thing with cancer- you never really get used to the feeling of having the rug pulled out from under you although it happens again and again and again. On October 30 he received his last dose of IV interferon. He switched to injections that were to be given at half the dose only 3 times a week. We anticipated things would become much easier. They didn’t. He began having cognitive difficulties. He was having trouble with memory and with basic functions. He began losing the ability to speak and started having “episodes” of total confusion. He couldn’t go out in public and was having sensory overload. He believed strangers were going to attack him. The rain on the windshield of the car in conjunction with the windshield wipers was too much for him. We had a very scary episode that caused the doctors to suspend his treatment indefinitely while we figured out what was happening in his brain. The fear was that the cancer had spread. He underwent an emergency CT and two MRIs of the brain to rule this out. Everything came back clear despite his intensifying symptoms. 9:36pm can brain mets not show up on ct but on MRI? We saw our specialist in Charlotte who recommended we cease chemotherapy. He told us with the symptoms we were experiencing the benefits of the chemo was outweighed. He said the damage we were doing to my husband’s brain was worse than what the cancer itself was doing. Our physician hoped within a month the neurological complications would subside as the interferon worked its way out of his system. The symptoms did not get better. In fact they seemed to get worse. He was demanding to see a psychiatrist. He kept saying “You broke something in my brain” to his doctors. “Now find someone to fix it! Find someone to put me back together.” I called every psychiatrist in town but none could see us before 6 weeks and they all required me to pay $400 up front before they would even schedule an appointment. With Christmas just around the corner this just wasn’t an option. I had finally hit my breaking point. I found a counselor that was recommended by a friend and I scheduled appointments. One for him and a separate one for me. We were not doing well. Our counselor diagnosed him with medical induced PTSD which is common in cancer patients. Thankfully after a few weeks we both began to find our balance and begin to return to normal. We are still in counseling and are still struggling with the reality of his diagnosis. We are still experiencing the aftershocks of treatment. Most of his neurological symptoms have gone away but his memory remains challenged at best. This is only a snapshot- it doesn’t even include the searches done from my phone which I assure you were abundant. But hopefully it will give you just an inkling of what someone going through a cancer diagnosis and subsequent treatment. It has been a long road but hopefully we are on the other side of this mountain. As a writer I want to tie this up in a nice bow with a nice ending for you but as a person I don’t think there is one. After December 15 my Google searches return to the mundane restaurant listing or movie review. But this archives a chapter in my life that cannot even begin to be described. Oh my oh my…. I really felt as if I were with you in your desperate searches… You have had a tough year! I wish you nothing but the best from now on and hopefully good news only! Your strength is incredible. David is so special to HL and me. Your love and faith will get you through this. Just know you are in our prayers constantly. Have you talked to your doctors about Immunotheapy. This has been vey successful for Melanoma patients. Read about the success that Pesident Jimmy Carter had with this treatment. They had given him 6 months to live and he is now cancer free. It is a very promising treatment for other cancers such as non-small-cell lung cancer and kidney cancer. My thoughts and prayers are with you. I went to high school with you father and mother and your Aunt Ruth.